Part of you already believes that buying a playset for your children is a good idea. But there are many great reasons to purchase a playset, some of which you may not have thought of. Whether you’re just looking for more information or on the fence about making a purchase, here are a few more insights to consider. Physical development is a big reason you have probably thought of, but you may not be aware of the why and how. A playground is a great place for a child to experiment with using hands, arms, and legs to interact with their world. Sure, it’s a fun escape for your child, but it also helps with important developmental milestones. Whether your child is a toddler or a pre-teen, a playset can boost their physical development in many areas. For instance, toddlers are just beginning to advance their gross motor skills (using larger body parts) from walking to running. A playset can also help introduce skills like jumping, swinging, climbing, and sliding. It will also help kids develop balance. Playsets also encourage fine motor skills (using smaller body parts) such as grasping handlebars and ropes, placing feet on small steps, and using hand-eye coordination. These skills are not only confidence boosting, but can also help kids improve in other sports they are interested in. Playsets encourage social development as well as physical. It’s important for kids to learn social interactive skills, whether it’s with siblings or other kids. A playset provides a perfect, somewhat structured environment for kids to experiment with rule-setting and cooperation, like in games of tag or “don’t step in the lava!” Having a playset in your own backyard is also an ideal way to invite your kids’ friends over without having to entertain indoors! Along that line of thinking, a playset is convenient for both your children as you as it allows you to stay close to home while still enjoying all the benefits of outdoor play. No need to pack up kids, diapers, and lunches. Simply “picnic and play” in your own yard. Playsets also give parents the option of getting things done in the house while keeping an eye on the kiddos. 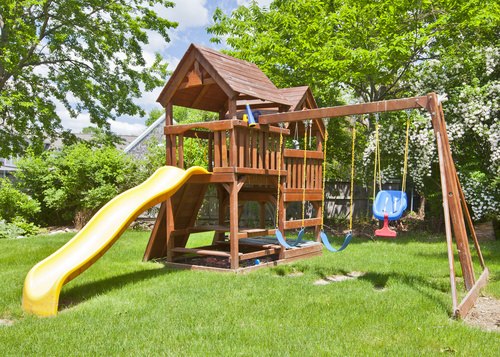 A playset is not only a fun fixture to have, but it is also a practical investment for your home. 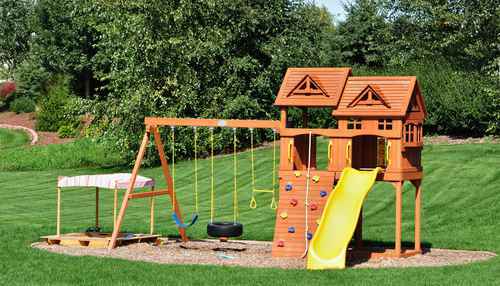 You can purchase high-quality playsets for relatively affordable prices, especially when you consider the value it adds to your home. It is a strong selling point if you ever sell your property, and some playsets are even mobile enough to take with you. A quality playset is built to last many years, so you can be confident that the investment is worth it. Besides being a practical asset, it is a intangible investment for your family. Your playset will provide countless opportunities for bonding time. It can lead to children having greater trust and respect for their parents, and lead to lifelong relationships and memories. One day it may even be a playground for grandchildren!